This is an easy recipe for Imam Bayildi - a Turkish dish, which has for a long time also been part of Greek cuisine. You need to use the long eggplants, not the round ones, and if you can get the striped eggplants, they are even better. Remove the stems from the eggplants and deeply score each one 3 times lengthwise, spacing the scores equidistantly around the eggplant. Place the eggplants in salted water with enough water to cover them completely and leave for an hour. Mix the onions, garlic and parsley in a bowl. 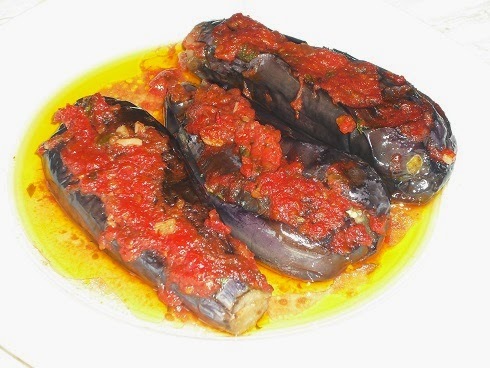 Squeeze the eggplants to drain the water and then spread a tsp of the mixture in each of the scores. Put the oil in a deep pan to heat and then deep fry the eggplants a few at a time. Put the fried eggplants in a shallow oven dish. Mix the tsp sugar with the grated tomatoes and spread over the eggplants. Cover with aluminium foil and put in a preheated moderate oven for approx. 30 minutes.